Testimonials About polinske & Associates, PC in Edwardsville | Polinske & Associates, P.C. As an out of state client, Polinske & Associates took my case. They ran the case without me having to come back to IL. My lawsuit was handled with constant phone communication that kept me in the loop at every step. They did a great job and were very easy to work with. Mr. Polinski has helped me out multiple times and very happy with outcome! I would highly recommend him when looking for a lawyer! Very professional and amazing results! Thank you Mr. Polinski!! Mr. Polinske and his staff did a great job and worked my case out quickly with a great outcome and I would highly recommend him to anyone. He was very helpful in a difficult time, explaining clearly the whole process. After posting bail I was able to return to my home state and he responded quickly whenever emailed or called. And I am very pleased with the result of the charges being dropped. I am under 21 and received a speeding ticket. Brian was able to appear in court on my behalf and obtain a dismissal of the ticket. I did not have to miss school, my parents did not have to miss work and saved my mom a ton of money. 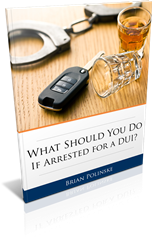 If you are looking to hire an attorney for traffic or criminal charges I recommend you hire Brian Polinske. The best around. Mr. Polinske did an excellent job taking care of my traffic citation. His fee for a traffic ticket was half of what other Madison County traffic lawyers wanted, He appeared in court for me, got my citation disposed of and my fee was reduced by half for the actual ticket. His office was professional and quick to respond with any inquiry I had. I was falsely charged with child abduction and Mr. Polinske got the case fully dismissed! I was faced with the difficult decision of which attorney to hire to represent me on felony charge entered in Madison County, IL. I was out of state and my life was at stake. I did not have much faith in attorneys due to hiring the wrong ones in the past who did nothing for me, but take my money. I can say without a doubt that Brian Polinske and his team at Polinske & Associates are the amazing. Jen (paralegal) and Brian were with me every step of the way and he delivered. I couldn't be more grateful or happy with the representation he provided and the service I received. He gets the results you deserve. He was able to get my felony dismissed, which was not an easy accomplishment. The best criminal defense attorney in this town. Brian Polinske is an attorney who is honest and a legal genius with integrity!! Attorneys like this are RARE. Do not consider anyone else or you'll regret not going to Brian first like I did!! I conducted a jury trial ending on September 22, 2016 and won all three felony charges against Mr. Trevor Bone in Madison County, Illinois. He was facing mandatory time between 4-15 years. This attorney did a wonderful job representing me in my case. He was professional and very helpful he got my felony charge dismissed. I will brag and recommend this lawyer until I'm in my grave!!!! Brian did an outstanding job for us over a very long and protracted process. Even though the charge against my son as a minor one and a first time offense, the county seemed dead set on pursuing it. Brian encouraged us to be patient and even when the county was offering what could have been deemed a reasonable out, he advised us to wait and that a better option should be forthcoming. In the end he was right. After almost 2 years, the county dismissed the charge and the whole silly situation is finally over and behind us. Brian & his wife did an amazing job. Brian & his wife did an amazing job representing me, he did all that was asked and more. He got a full dismissal of the case and I'm very pleased with the outcome. If your looking for a criminal defense attorney who works with you to the fullest, he is it!! You won't be disappointed. Brian did everything he said he would do. His staff was / is very polite and seemed to be concerned about my case. Brian even went out of his way to help me. My son received traffic tickets for two separate instances. Brian Polinske got all of them fully dismissed. I have retained Brian Polinske for several traffic citations that my son has received over the past few years . My son has never once had to appear in court and Brian was able to get a dismissal on the tickets. I have and always will refer family and friends in need of an attorney to Brian Polinske. I am a recent college graduate who came to Brian after being arrested for a DUI and several smaller offenses . He was highly recommended by people in the area and after my experience I can understand why. In addition to the DUI, I was charged with possession of drug paraphernalia for possessing a cannabis grinder and for an open-container violation due to a beer sitting in my passenger side floorboard. As promised, he was able to get the paraphernalia and open container charges dropped. Additionally, he was able to keep the DUI charge off of my permanent record and I kept my license. As an aspiring doctor, it was of utmost importance to not have a permanent criminal record. Brian has experience dealing with aspiring professionals and worked with me closely from the beginning and understood my priorities. He was able to negotiate a deal on my behalf that I was very satisfied with. Brian definitely did not walk me through every step of the process and this made me nervous at times. However, when something important happened or when I grew worried, he took the time to let me know everything was going according to plan. In retrospect, I realize it was only his extreme confidence in his ability to deliver what he promised that led him to move the process along without keeping me updated every step of the way. If you are looking for someone to constantly update you at every step of the process, Brian may not be your man. However, if you are looking for great results and someone who delivers what they promise, Brian is your guy. In the end, I was extremely satisfied with Brian, the temporary displeasure of dealing with uncertainty was more than made up for by the results Brian was able to deliver.